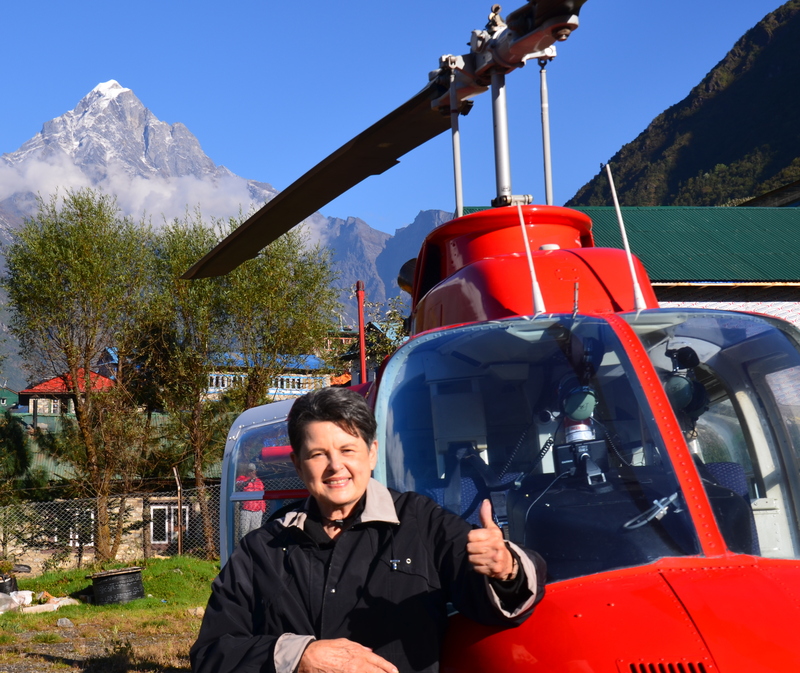 All of us were warned of the many dangers of flying in a helicopter in the Himalayas to see Mt. Everest. But no warning was bad enough to make 7 of us on our A&K tour stay in Kathmandu, Nepal. So we climbed into 2 helicopters and off we went. Denise and I were in the smaller helicopter and the other 5 were in the larger one. The view was outstanding from the helicopter and it felt just like the opening movie of an IMAX Theatre where the helicopter takes the viewer on a breath taking ride up, down and around the mountains flying tilted to the left and then tilted to the right and back and forth. Below us were perfectly manicured farms and farm houses sitting right on the side of Himalayan mountains or small plateaus, and we could see the people going about their daily chores. 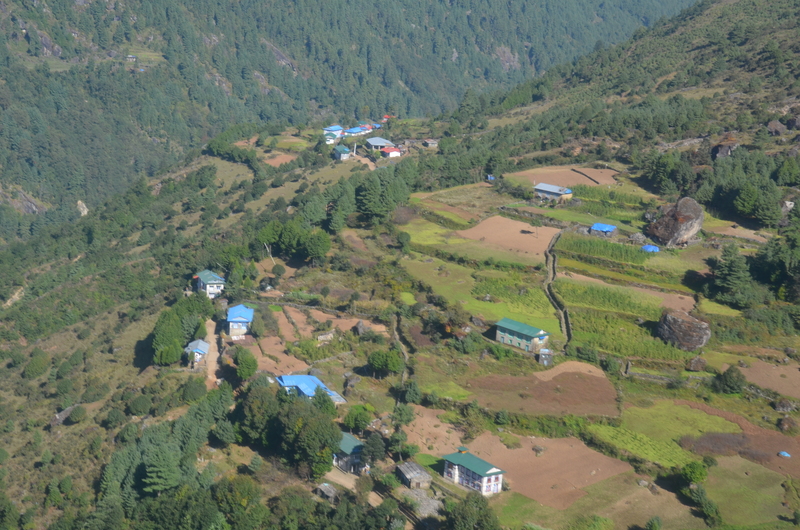 In all of my years dreaming what the Himalayas would be like did I ever expect to see farms and houses sprinkled high in among them. And they were everywhere. How could they get to their properties, what kind of vehicle was needed to reach it, how long did it take, how could they stand the weather and altitude, and where was the nearest market for supplies? 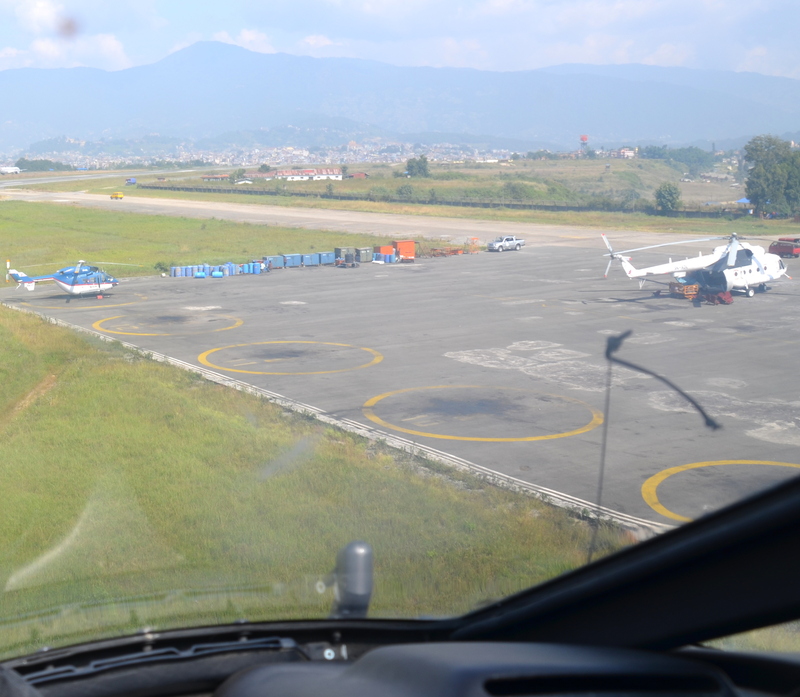 It was an exhilarating ride for 50 minutes and we landed in Loukla, Nepal on a plateau high in the Himalayas, also known as the world’s third highest airport. It had a little paved runway, just long enough for small planes to land, and land they did. While waiting for 40 minutes, we observed people coming, going and changing planes, just like any airport. And the personnel would even add gas if needed, but it was a basic airport with no frills. Gas was brought out in plastic jugs. 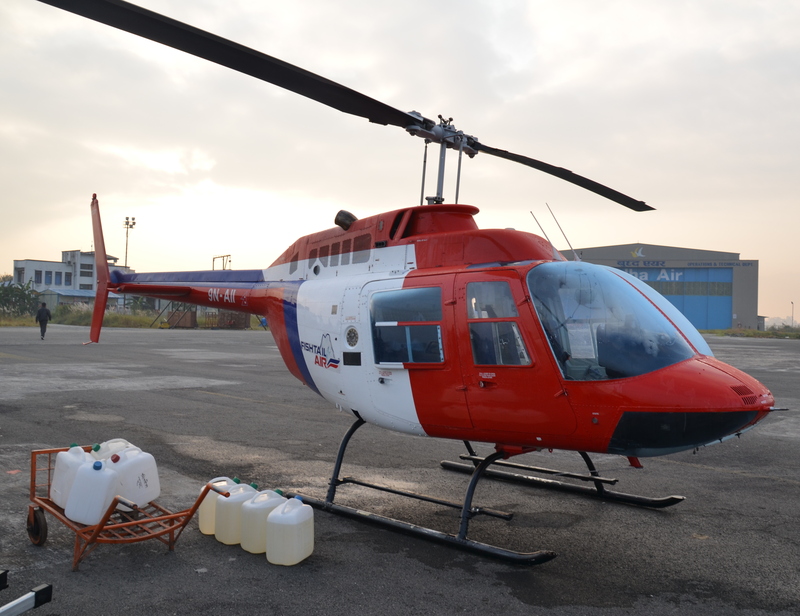 Our helicopter landed in Loukla right in the middle of a cleared gravel area and there we watched standing on the sideline while a new pilot, Steve from Australia, entered our helicopter and started checking all gauges and everything else needed to continue our flight. He even climbed to the top of the helicopter to check the blade system and looked down each blade to make sure all was in excellent working condition. His final check was cleaning the windshield as he was almost ready to take off. Still on top of the helicopter, he scrubbed the windshield with paper towels while spraying with a Windex-like cleaner. Then he moved to the front windshield and the bottom windshield. In all of my years of flying, I had never seen a make ready of a flying vehicle done right in front of my eyes. As he was cleaning the windshield, I asked Steve if he would also clean the side windows so we could take photos of those awesome Himalayas while we were flying. “I only care that I can see”, Steve sharply replied. I was stunned at that answer as I was the customer and I had paid dearly for this excursion to Mt. Everest. We finally boarded the helicopter for the continuation of our dream ride to see the world’s tallest king of the mountains. Since Steve was a new pilot for us, we went over the tour places we were going to visit on our tour on the way to Mt. Everest. “I am going to take you directly to HEV (Hotel Everest View) and I will need for you to get out as fast as you can,” Steve ordered. 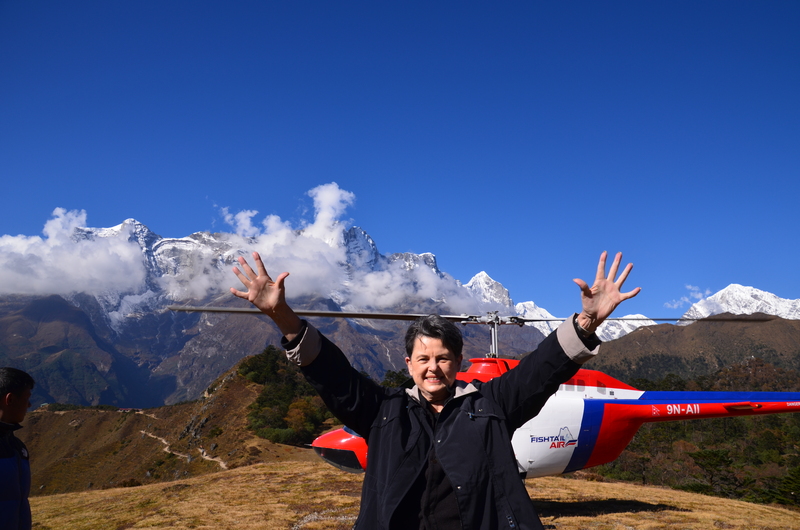 We were stunned again as our tour included visiting a monastery sitting high atop a Himalayan mountain and then flying close to Mt. Everest before landing at HEV. Steve gave me a set of headphones to wear so I could talk and hear during the flight. Through those headphones, I then heard Steve talking to the control tower person at Loukla and Steve repeated “HEV and search and rescue” to that control tower person. So off we went and I was in the front seat beside the pilot with the most exhilarating view above my head down to my feet. It was like another IMAX Theatre opening where you feel like you are flying. And we were, for real. And the front windshield was clean so I could see everything. “There’s the monastery,” Steve said to me pointing to it on the left. So I took a photo because I knew then I would not get to see that monastery as we continued flying. The monastery was beautiful from the air and again, I wondered how the monks accessed the property high in the mountains and how they lived way up there. 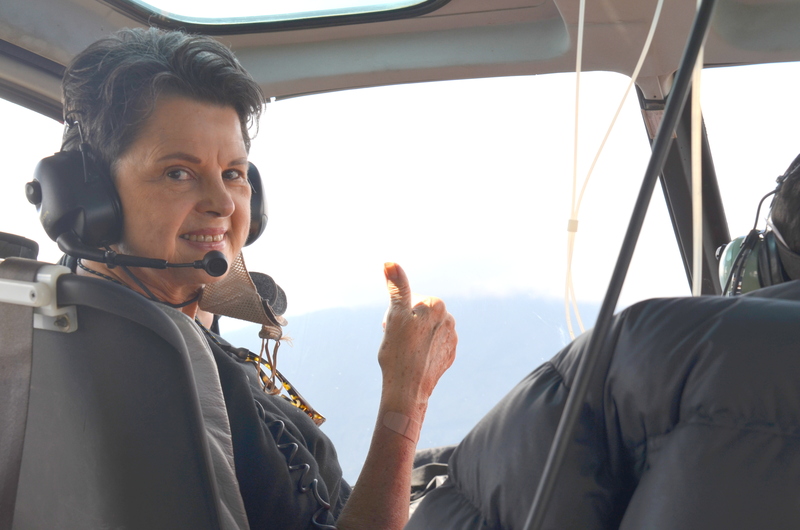 As we were climbing in altitude to HEV, Steve said to the helicopter, “Climb baby climb as this helicopter can’t climb over some mountains.” That sure got my heart really pumping faster and I begin to wonder if we would crash or ever see Mt. Everest. 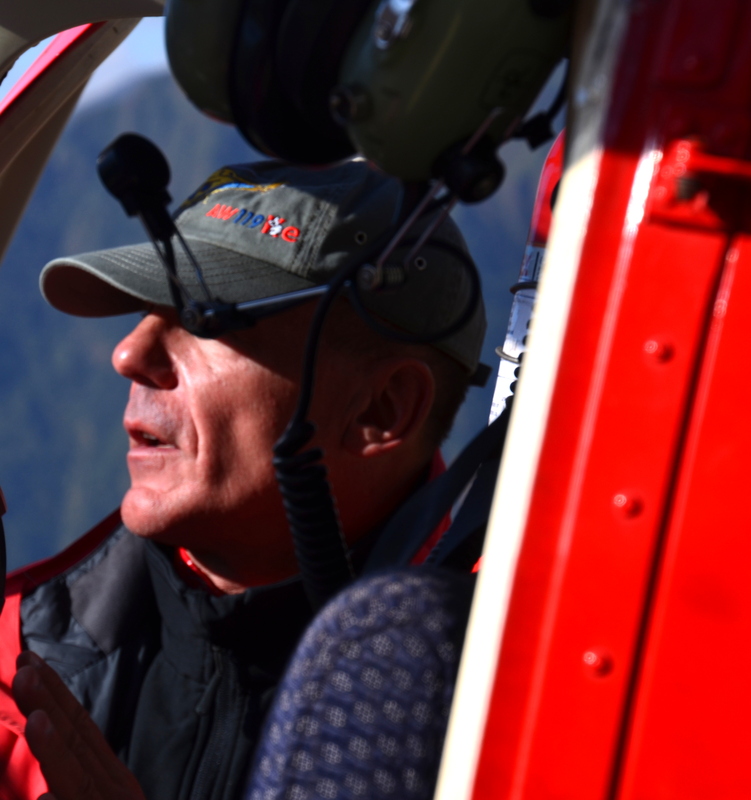 I then realized we were in a helicopter that could perform only at limited altitudes in the Himalayas. 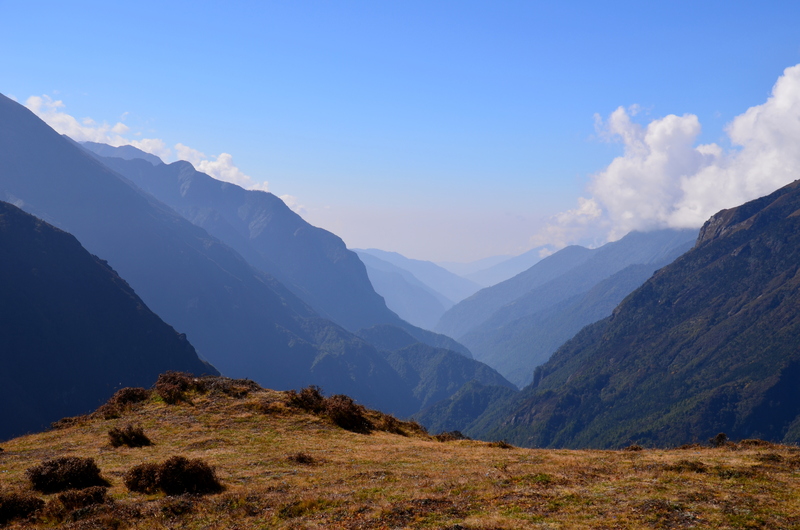 We landed at HEV on a high open field on the top of a Himalayan mountain. As ordered, we got out fast and got away from the roaring propellers as fast as we could. When we had cleared them, Steve took off. We stood, waved goodbye and watched. I felt like Maria in the “Sound of Music,” standing on top of that huge mountain surrounded by other high mountains and valleys below. It was awe inspiring at 13,000 feet, the highest I had ever been in the world. And that was low compared to Mt. Everest which was looming in the background at 29,029 feet. 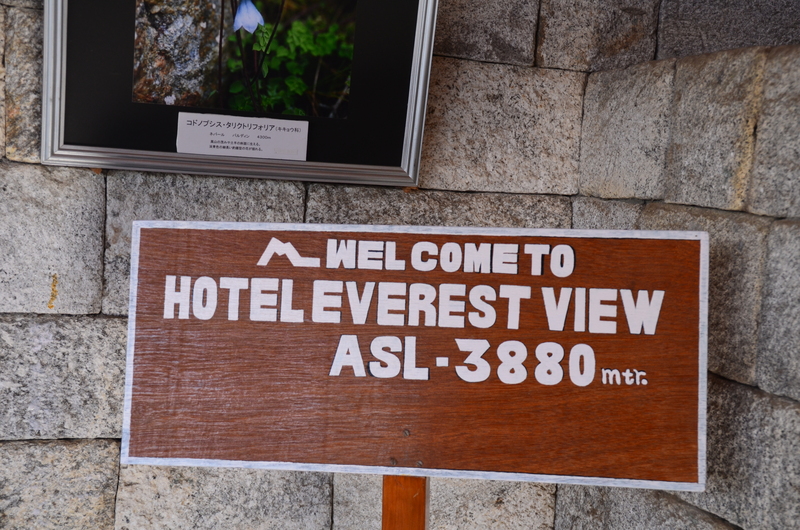 HEV was a modern hotel and a main spot for trekkers to stop and for tourists like us to see Mt. Everest. 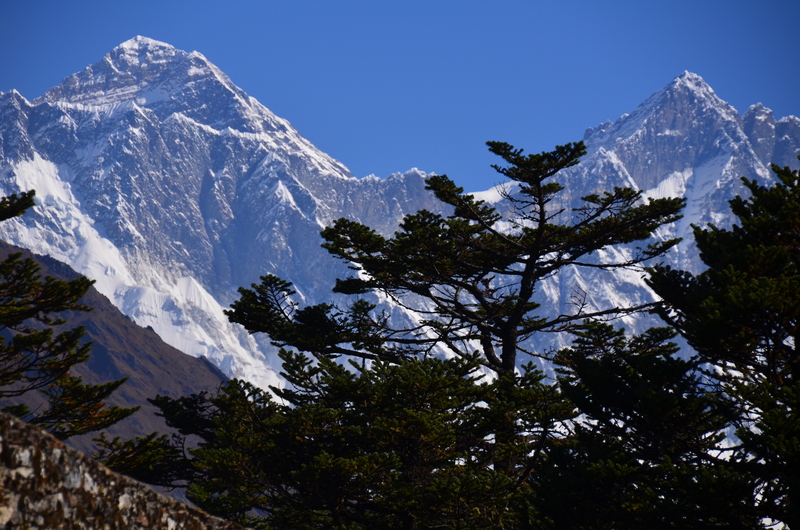 We headed straight to the back patio and there was Everest in and among the other peaks. But the peaks looked closer and taller than Mt. Everest. It was, we were told, because Mt. 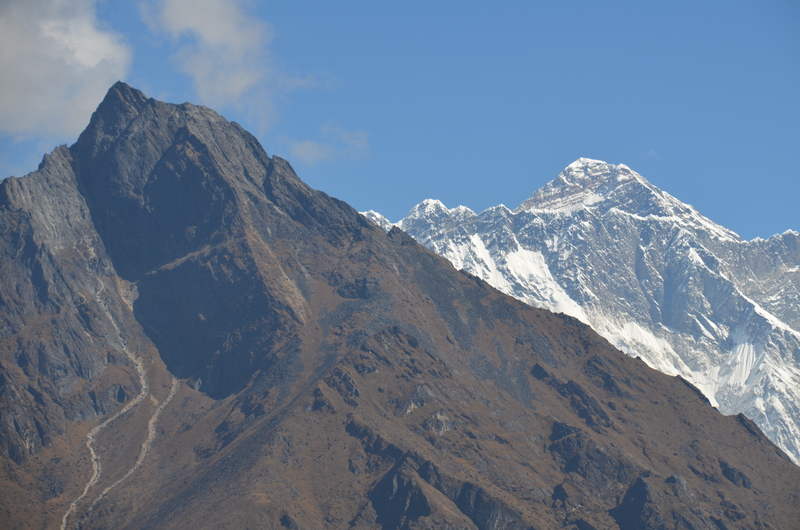 Everest is further away and the other peaks are closer. It looked just like the photos do. It took a few minutes to sink in that I was actually seeing THE MT. EVEREST. 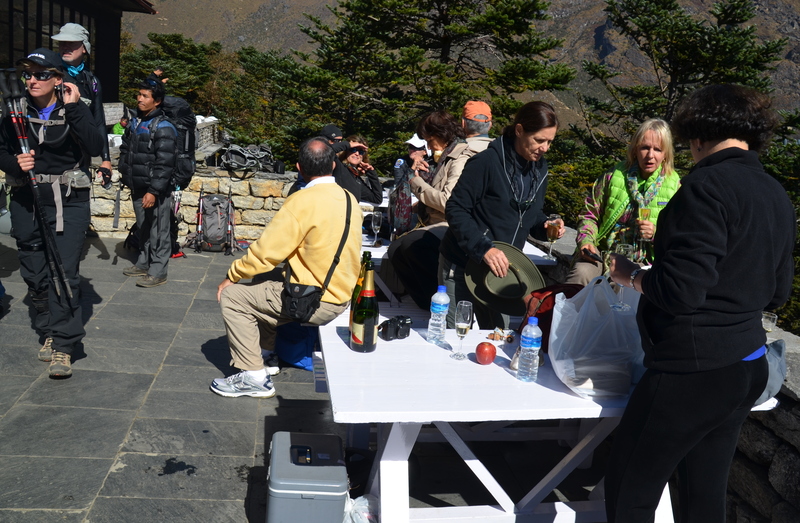 And the other 5 members of our Abercrombie & Kent tour of Nepal and Bhutan were just as excited as we were. They had arrived first at HEV, so when we arrived, it was time to bring out the expensive French champagne we had all chipped in to buy for this auspicious occasion. 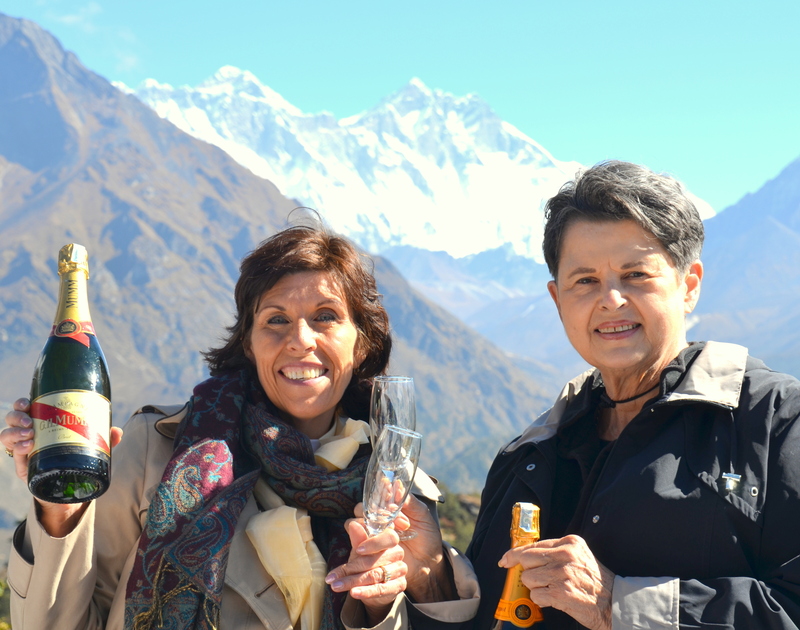 And as we sipped champagne, we all had our photo taken with Mt. Everest in the background. It was another PRICELESS, ONE-OF-A-KIND moment in our lives and a dream come true. We never thought we would ever get to see Mt. Everest with our own eyes. 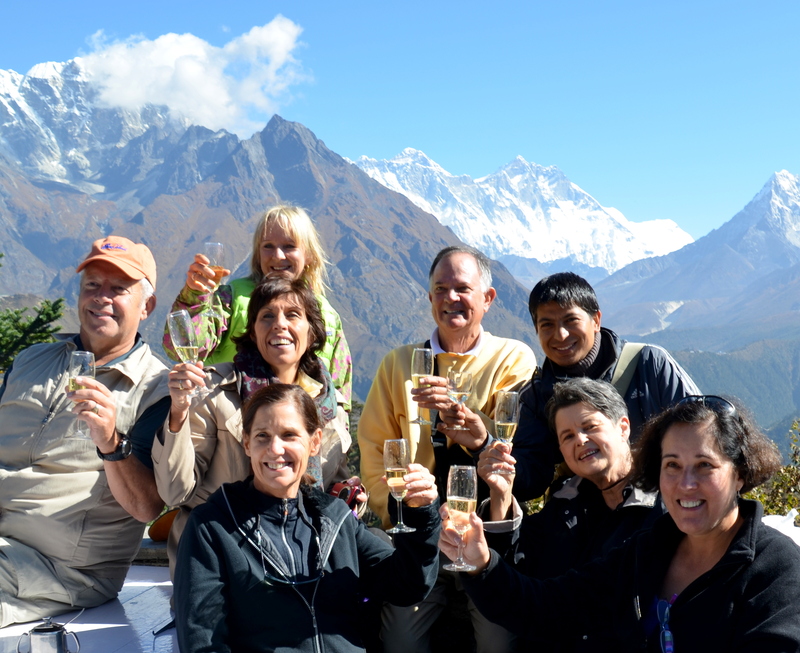 After about 30 minutes of celebrating with Everest, our A&K friends and champagne, a leader said to us all, “one helicopter is ready to return to Kathmandu. Who would like to go on it”? Remembering the warnings and dangers we were told about, I was honored to just have made it here without problems and I didn’t want to gamble any longer. So, I immediately offered to return, with Denise, and Wendy. It was a perfect 75 minute flight back with beautiful views of the Himalayas every second. It was on this flight we learned that Steve, the pilot who flew us to HEV, was a search and rescue pilot for the Himalayas and that he makes around 300 search and rescue flights each year looking for lost and stranded trekkers. That was why he made sure he could see in the windshield from above his head to below his feet. It was also why we did not get the tour we purchased like the rest of the group received. We were held for 40 minutes at Loukla to change pilots while the other helicopter with our tour members landed briefly then took right off as we watched. While we offered to return first to Kathmandu, the other 4 on our tour opted to stay longer at HEV. But their extended stay didn’t last long because the weather suddenly changed for the worst and they could see it rolling in causing them to leave HEV immediately, hopefully getting out in time. One of the A&K passengers is a pilot and she said she had never experienced anything like it and the return flight. 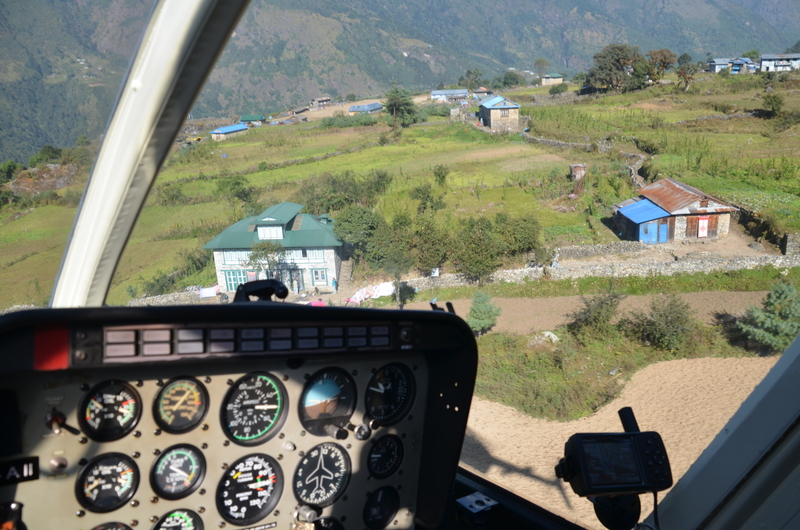 To make it back to Kathmandu, the helicopter had to fly 10-20 feet from the side of the mountains, not out in the open valleys like we did. “It was so dangerous being close to the mountains to see our way back,” the lady pilot on the A&K tour said breathlessly. “It was an extremely stressful 75 minute ride.” But it wasn’t without incident as one of our A&K tour members became sick with the drastic change in barometric pressure. Finally, all members had landed safely back in Kathmandu where we began and we all agreed it was a fabulous trip and well worth it all. Sometimes, we agreed it pays to take a risk in order to enjoy the world’s top natural wonders. We all took that high risk and won. Aircraft and mountains (big ones) always a tricky combination…hope you enjoy these rest of your trip, where to next?